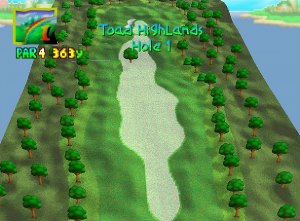 3D gaming is where I pretty much lose interest. 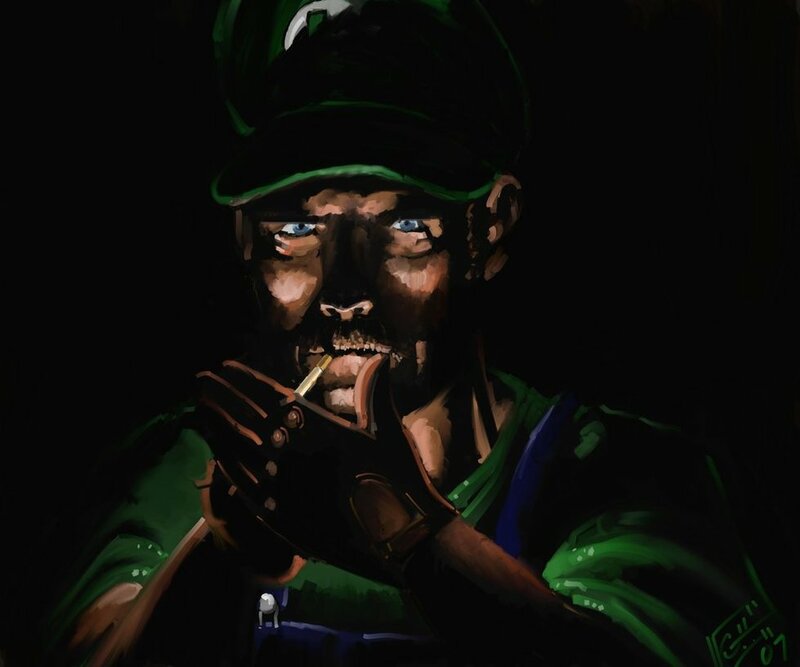 The primary appeal that video games have for me is their ability to stimulate my imagination, and the more like real-life these games appear, the less interesting they are to me. 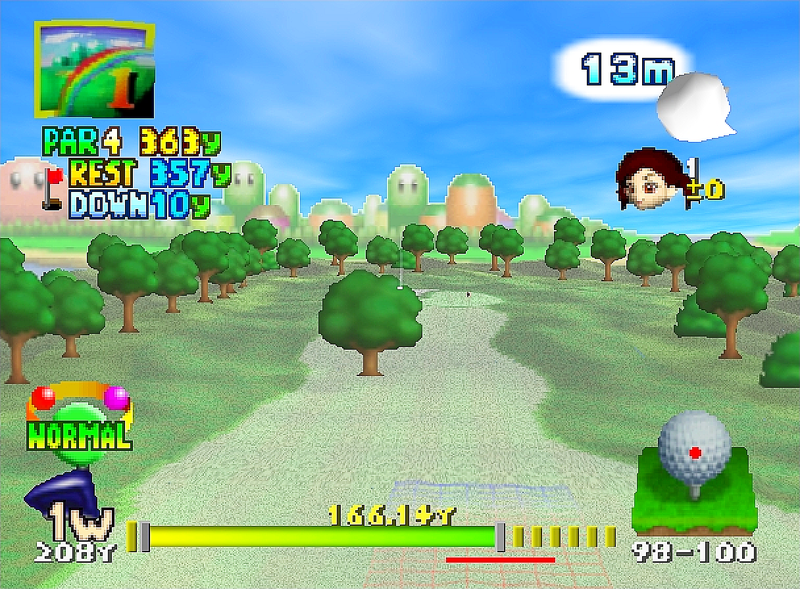 That’s not to say that games made for the Nintendo 64 looked anything like real-life. 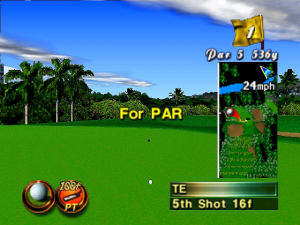 This system got a reputation for colourful, cartoony 3D graphics compared to its competition. But by this stage in the history of video games, if you weren’t making or supporting 3D video games, people didn’t want to hear about it. 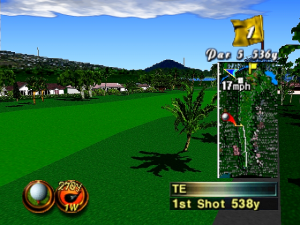 Golf games can be handled extremely well when they’re done in a full 3D environment. 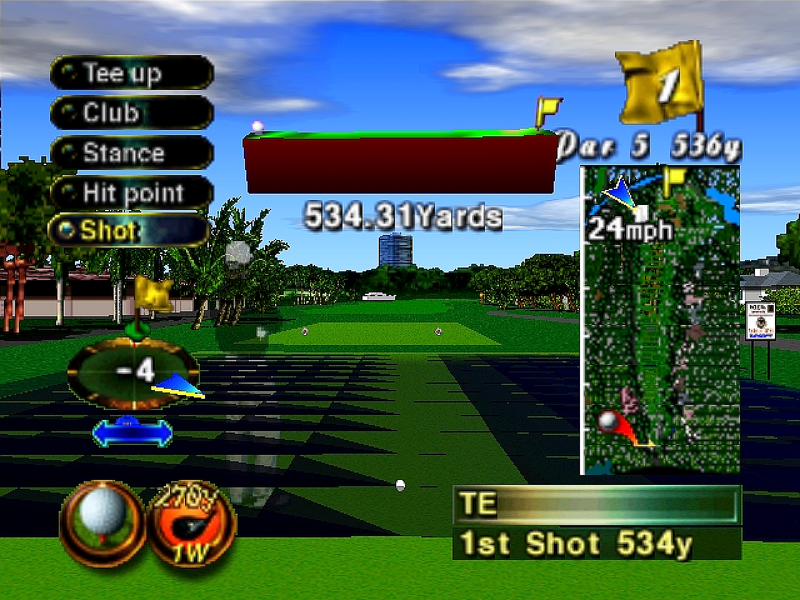 Just take a look at my review of “MicroProse Golf” for the Amiga. But like any new (or relatively new) technology, there could be a gimmicky aspect to it, and 3D could be misused or done wrong. Back in the here and now, 2D games have made a sort of small-scale comeback and have a niche market in the form of retro-gaming and 2D independent games. Take a look at Mega Man 10 for an example of a big-name game that was made in 2D as recently as 2010. 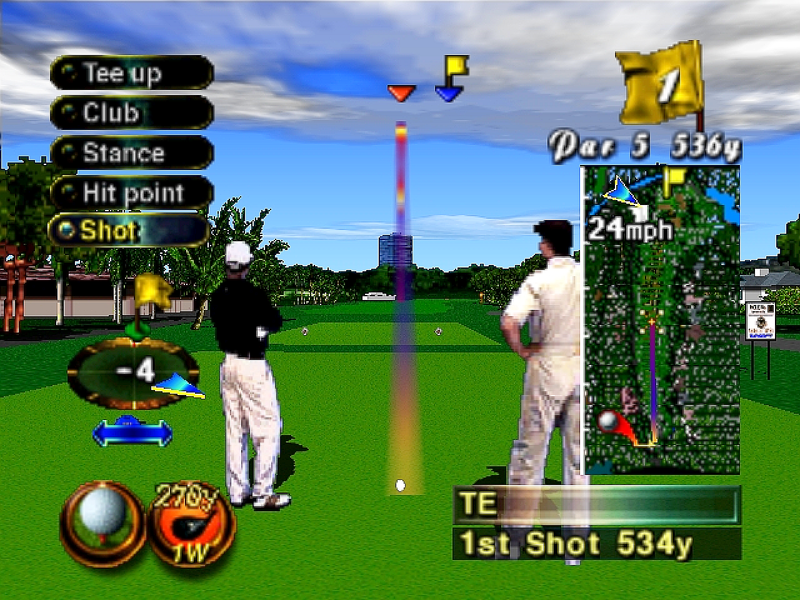 When I look at modern games, I see a controllable movie filmed in unconvincing computer graphics, and that just doesn’t appeal to me. I know I’m in the minority in this. Back in the late 90s, I remember reading articles that posed the question “Are 3D graphics killing video games?” It’s obvious now that they didn’t, but I think that they just widened and shifted the audience. 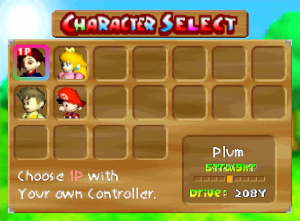 Even though you get the promise of playing as all the characters you see on the box, when you start you can only play as one of these four. Pressing left, down and right on the camera pad will alter the character’s colours as you choose. It was a pretty complicated beast. 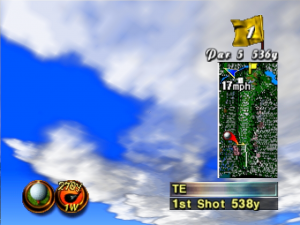 In fact, I had to dig out my Saitek gamepad because my trusty Logitech doesn’t have enough buttons in the right locations to make it a good match for the N64 controller. 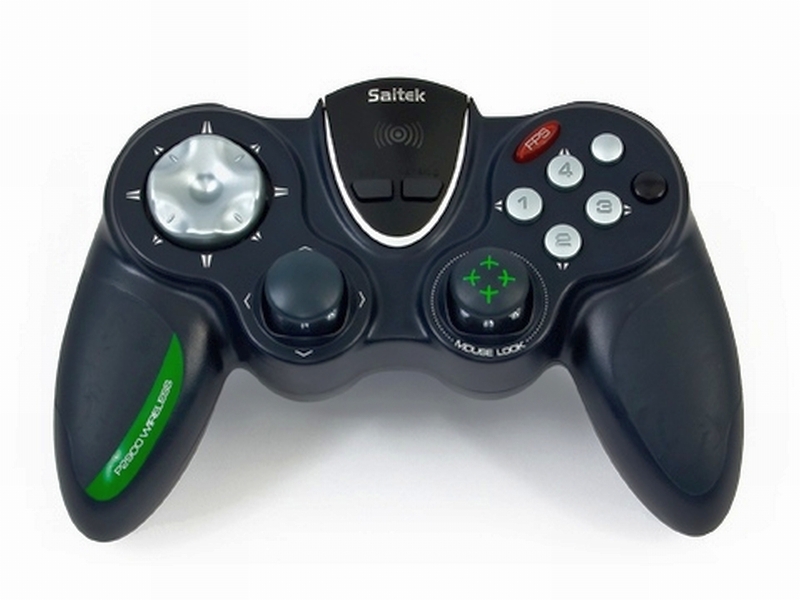 The Saitek P2900 has two sets of shoulder buttons, and that’s where I mapped the start button and the Z trigger. 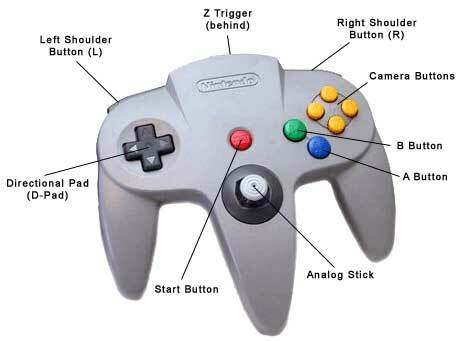 Sadly, it’s all but impossible to find controllers with six buttons on them like this one these days. I use this one for certain Sega Genesis and Sega CD games that make use of 6 buttons as well. The direction pad and the analog stick can be used to navigate the menu. A confirms selections, B cancels. By the way, there is music constantly playing in this game, and it can not be turned off. You can choose between tournament, ringshot, speedgolf, stroke, minigolf and training styles of gameplay. 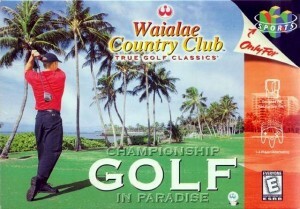 You get to choose from one of two courses, but only one is available from the start. 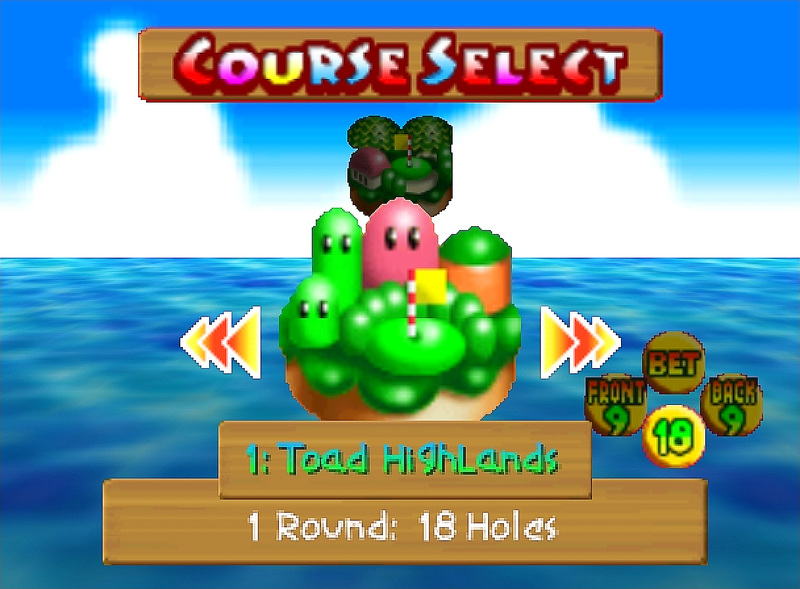 There is a brief top-down view, all spazzed out with hyper music and rotation effects. There is also a brief flyby so you can see the hole you are about to play. 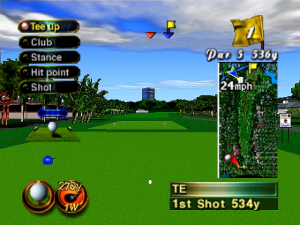 The course view is active and colourful. 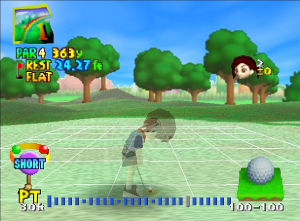 They went a little overboard if you ask me, but I think this game is clearly aimed at kids. 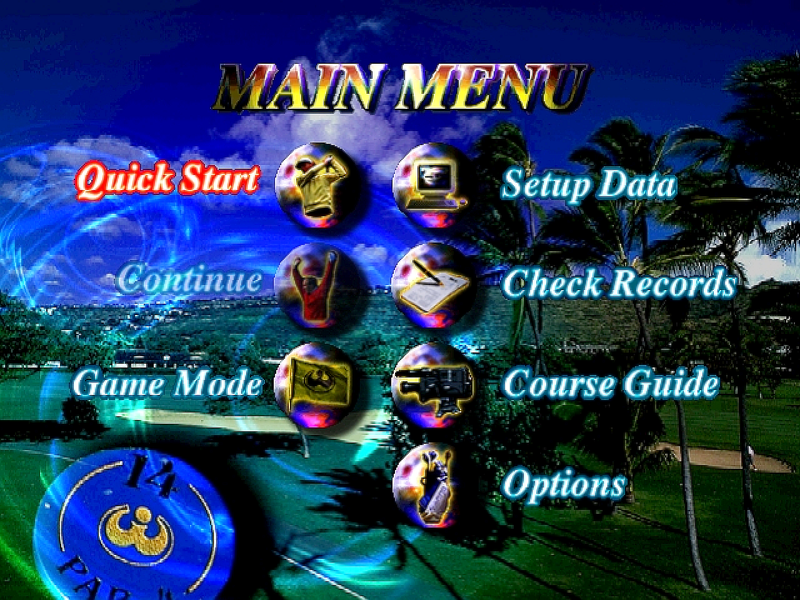 Start brings up an in-game menu. 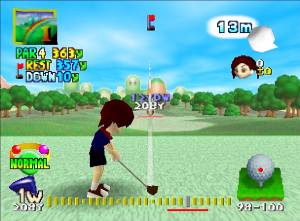 A swings, B changes your shot from “normal” to “power”. Left and right on the direction pad (or the analog stick) will aim. 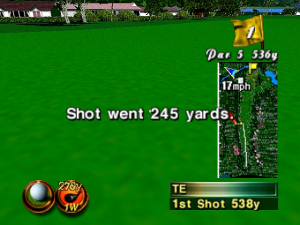 You have a constant “aiming arc” thing that won’t go away. 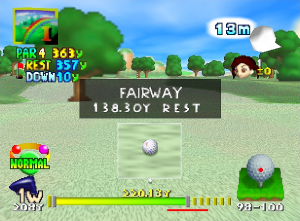 I find it distracting and can’t fathom the need for it, but it’s part of the game. I don’t think it can be turned off. 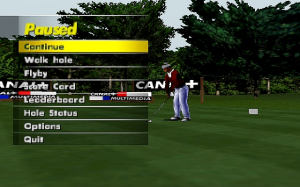 There are some very useful camera controls in the game. If you’ve ever played Super Mario 64, then you will remember the bee with the camera. 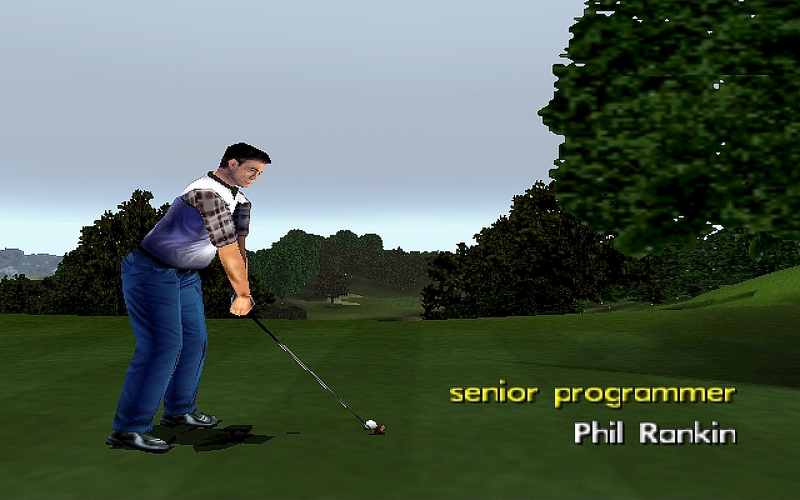 He makes an appearance here too when you use the camera controls in this game. Use the L, R, U and D buttons on the camera pad to control the view. Press A to snap it back to default. Pressing the left shoulder button or the Z trigger will bring up the ball contact controls for aiming. The direction pad moves the cross. 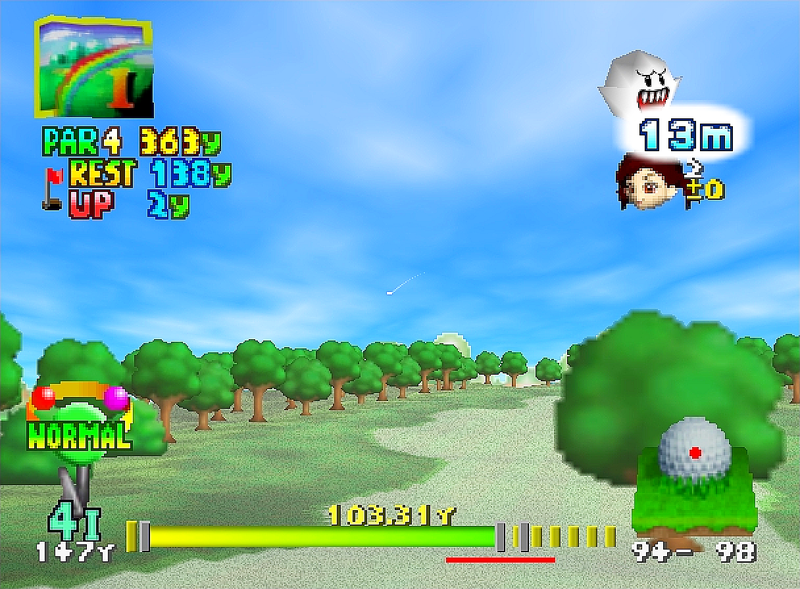 The right shoulder button will zoom the camera to the opposite end of that aiming arc. This is so you can instantly see where your shot will end up. 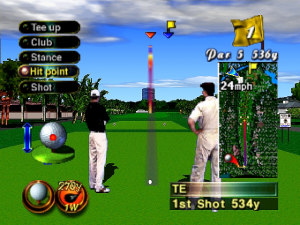 Up and down on the direction pad (or the analog stick) will switch clubs. 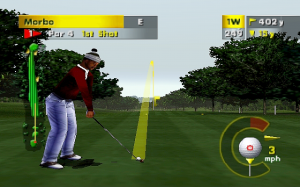 Once you have set up your shot, press A to start your swing. 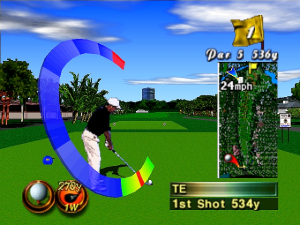 The power meter is at your feet, and it is 3-button press style. 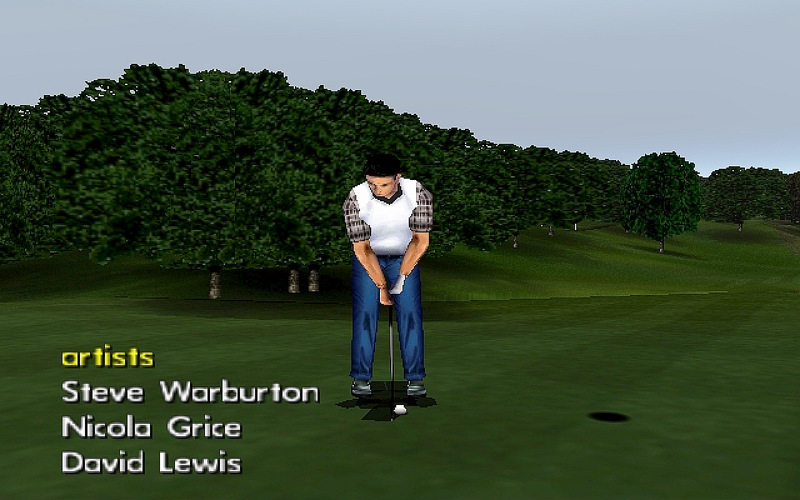 The animations in this game are very smooth, and are not marred by any glitches or problems. The ball physics are great too. 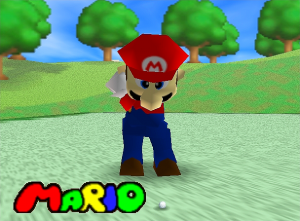 When you make it to the putting green, the music changes to a funky dance remix version of the “underground” music from Super Mario World. 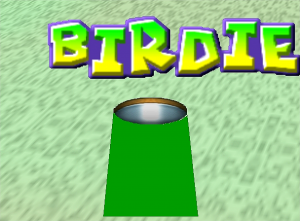 If you’ve ever gone down into a green pipe, you know what I’m talking about. 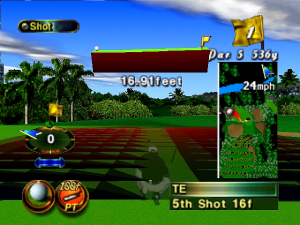 You get to see a terrain grid on the green, and you also get to see your golfer avatar flash on and off in transparency because it blocks the view of the hole. I can’t help but wonder if this couldn’t have been handled better somehow. 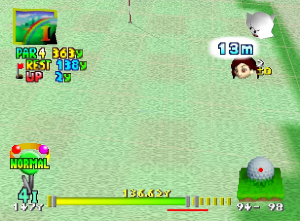 The power meter is now 2-button press style. 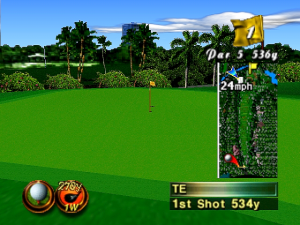 The strength of your put will diminish as you get closer to the hole. But this game is bright, sunny, fun and breezy. It’s also too easy. 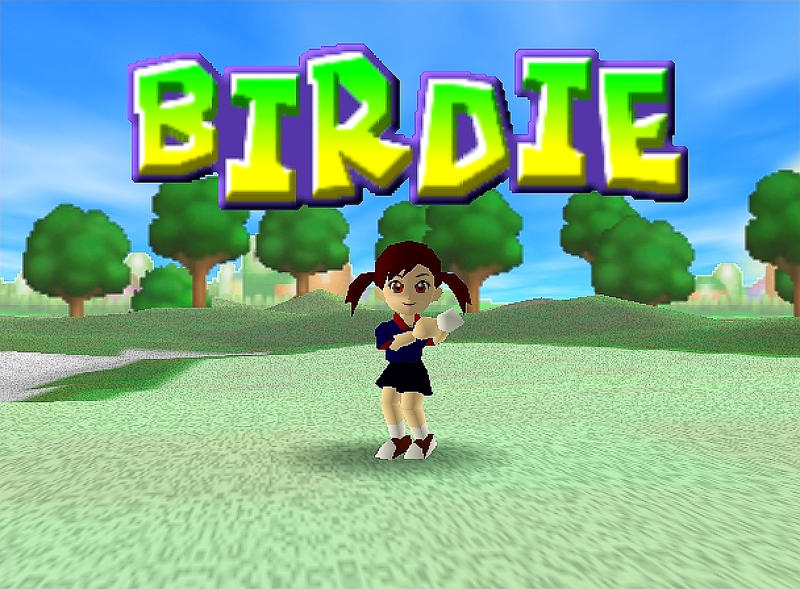 I didn’t try out any of its novel gameplay styles like ringshot, speedgolf, or minigolf, but I might return to them some day. And I suppose that a big part of the fun that a kid could have with this game is in unlocking the characters you can play as. 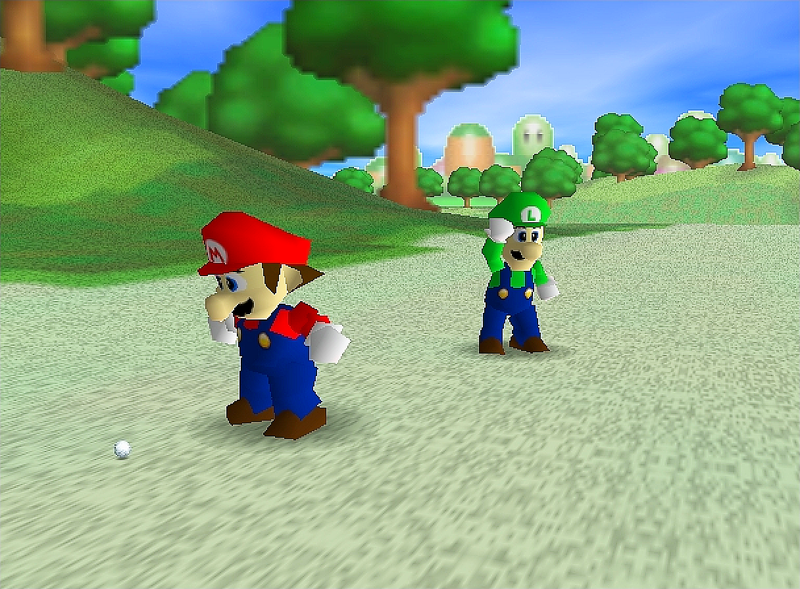 Though who would have fun playing as Luigi? I’m kidding Luigi, please don’t come after me. 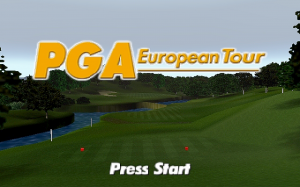 Considering how this game shares its title exactly with the golf game that I consider to be the very best there is, “PGA European Tour” for the Sega Genesis, I had to try to look at this one without any preconceptions. 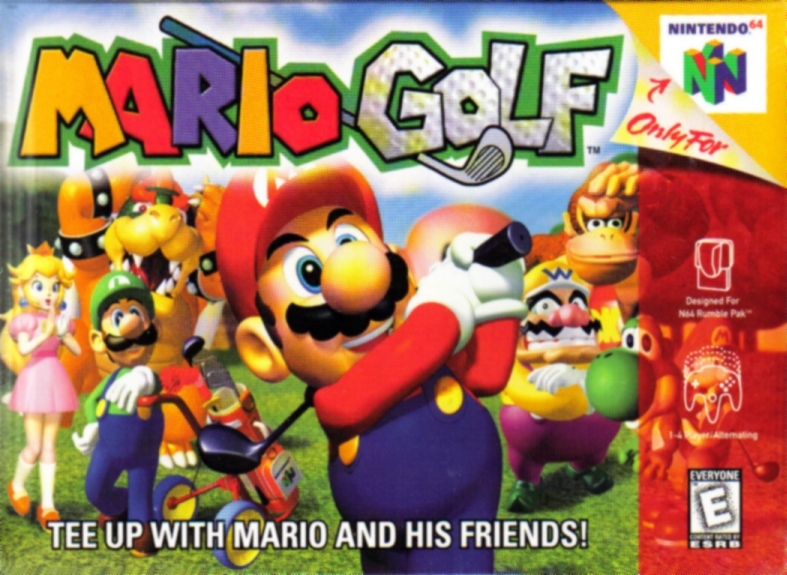 This was made harder by the fact that while I was looking for the box art to include in this post, I came across some reviews for this game which ranged from decent to terrible. 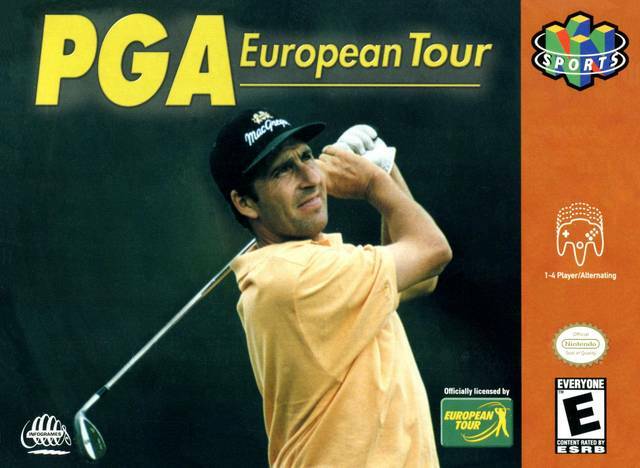 The consensus at the time this was released seemed to be that this game is boring. 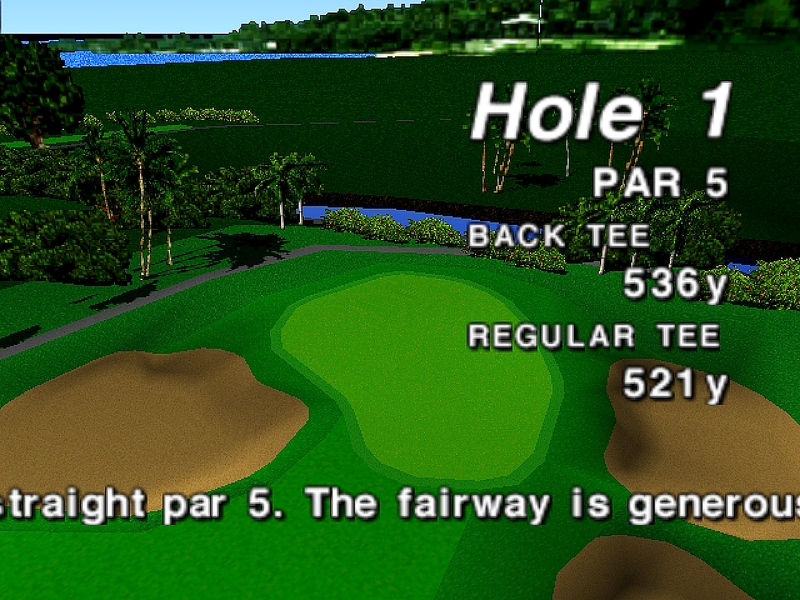 Well, I’m willing to bet that the golf games that I enjoy playing would be considered boring my most video game reviewers. This game isn’t full of flashy graphics, seizure-inducing cut-scenes or obnoxious rock/rap/techno blasting out of the speakers. 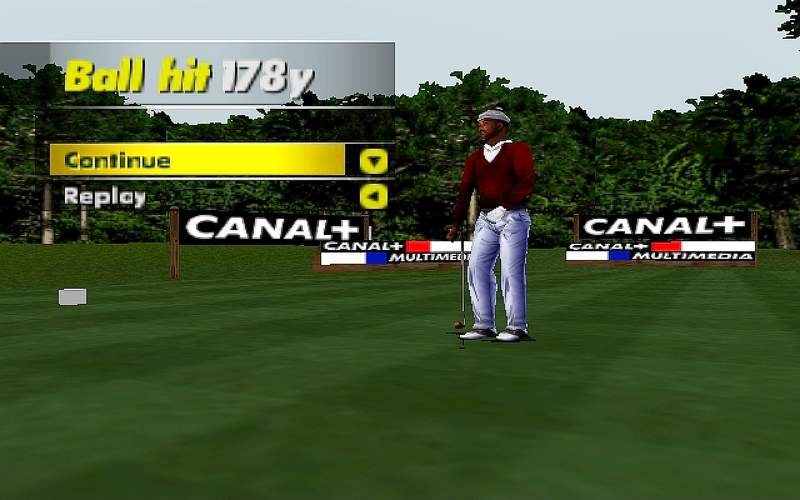 It does attempt to provide a serious simulation of golf, so let’s see how it succeeds at that. Coming along two years in as it did to the N64’s life, it has a nice look to the graphics. 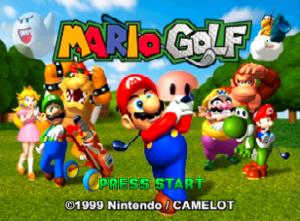 The N64 was no longer untested hardware at this point, and lots of tricks had been learned by game developers and coders to get the best out of the system. 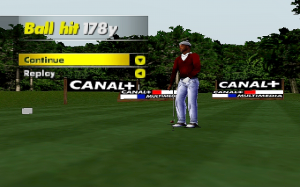 Among the options you can choose at startup are the appearance of your golfer. 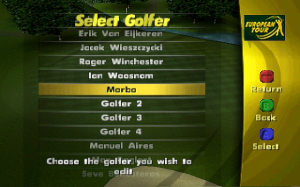 You can choose from 64 professional golfers or four standard players. 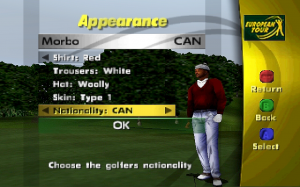 You can change the name of your golfer and customize the outfit he wears. 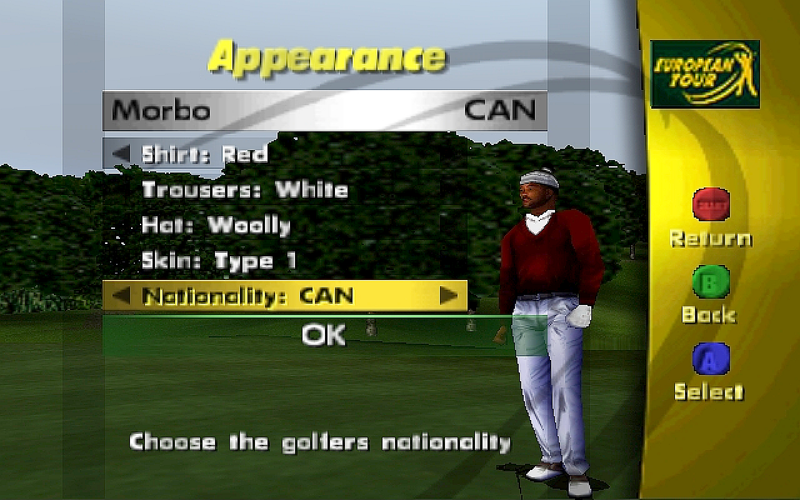 You can also change his skin type and nationality, and give him a hat if you wish. I just wouldn’t be a Canadian without my toque, eh? 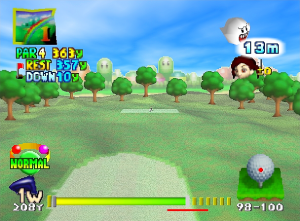 The course view is clean and uncluttered. There are more setup options available for this view as well. Ah, the golden piss rainbow. I really don’t understand why this is any help. 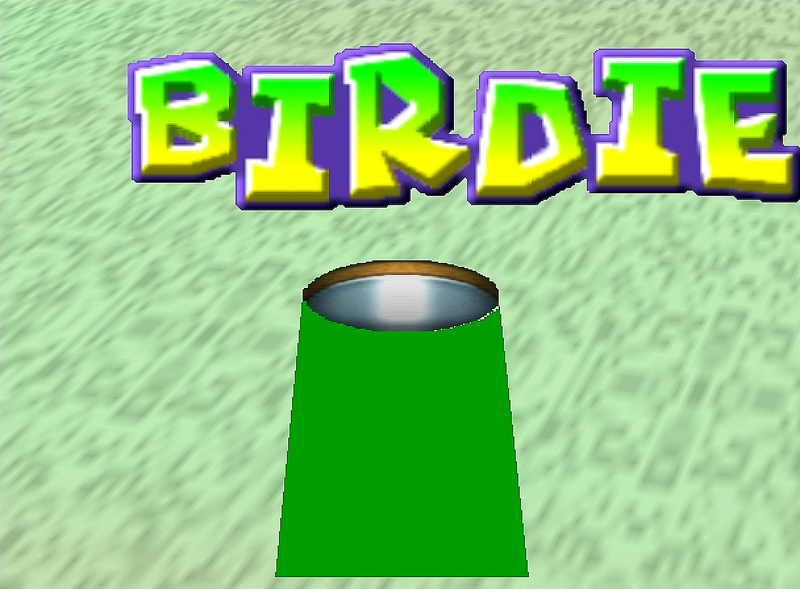 It can’t be turned off, though in this game it is actually far more useful than in the other games I’ve seen it in. 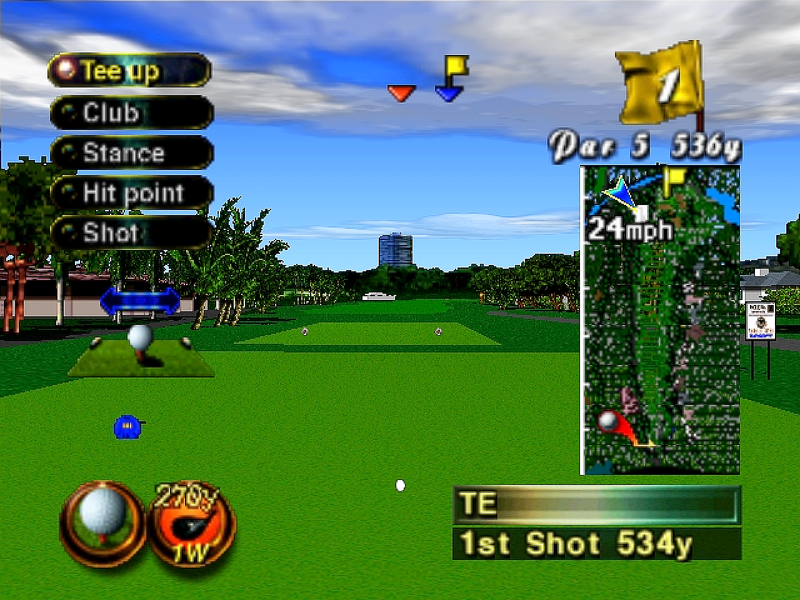 It not only shows where your ball is aimed at, but it also shows the elevation of different shot types as you change shot type. But again, I don’t see why it’s needed at all. 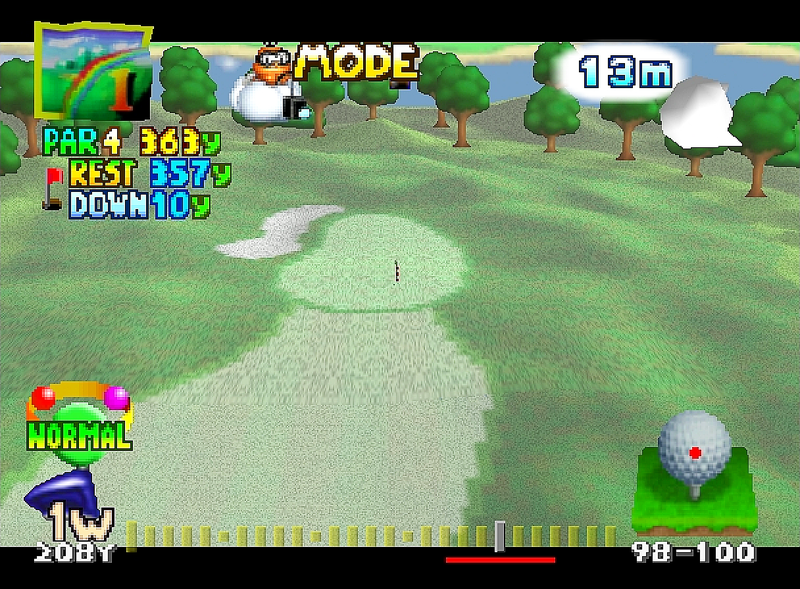 Pressing L on the camera pad will toggle a hole map on and off. 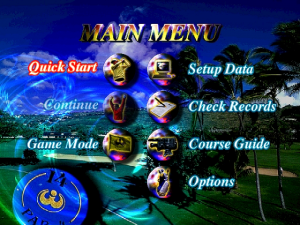 Pressing the Start button will pause the game and show you an in-game menu. 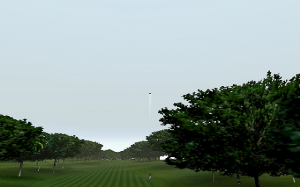 Back to the camera pad: holding D will zoom the camera over to the destination of your current shot. Releasing it snaps the view back. 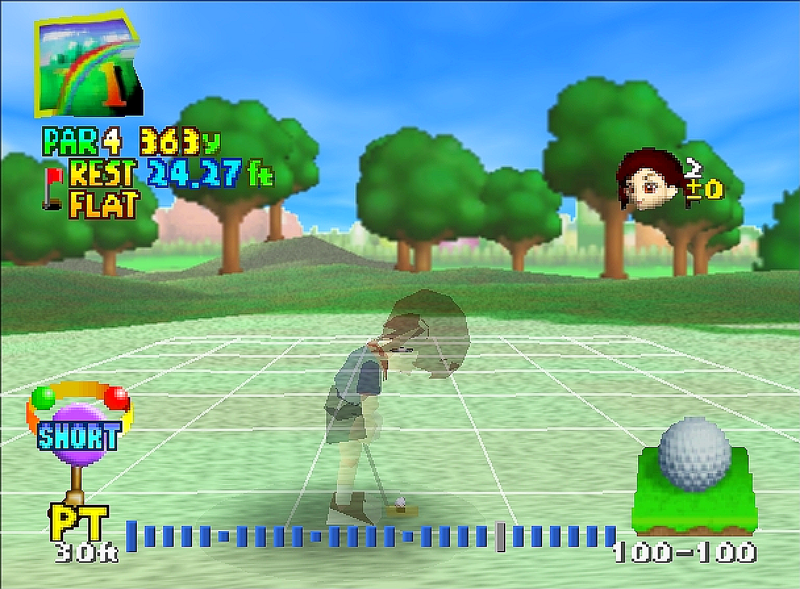 Holding R allows the direction pad to aim the camera around, allowing you to rotate and move your view around the hole. Pressing U on the camera pad returns the camera view to its default position. The left and right shoulder buttons (and oddly the Z trigger) control the striking position on the ball, which is graphically represented by a shift in the piss rainbow aiming arc and on the golf ball inside the power meter. 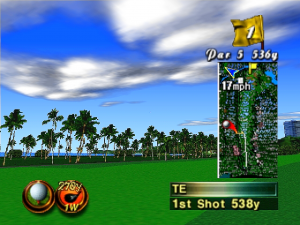 Left and right on the direction pad or the analog stick will aim the shot. Oddly, I couldn’t figure out how to switch clubs. 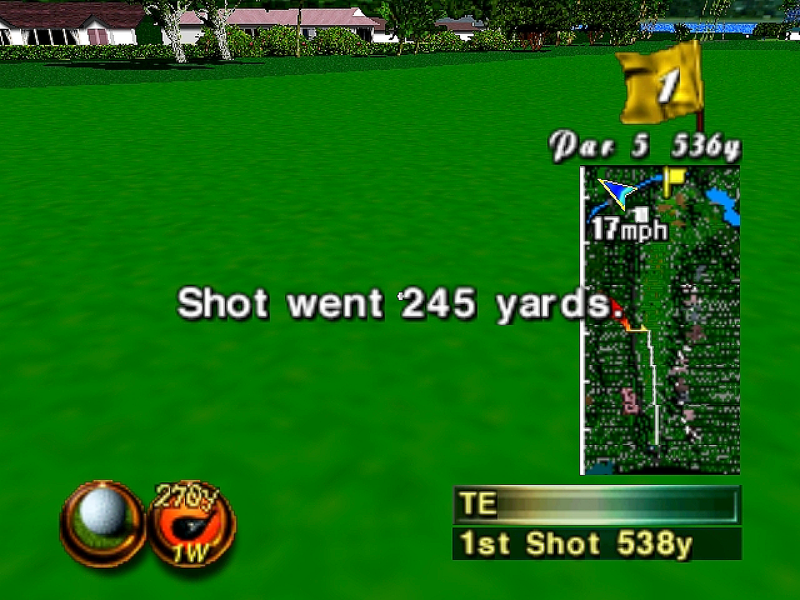 I’m not sure if you even can do that in this game. The power meter is 3-button press. The speed at which it moves is also variable. 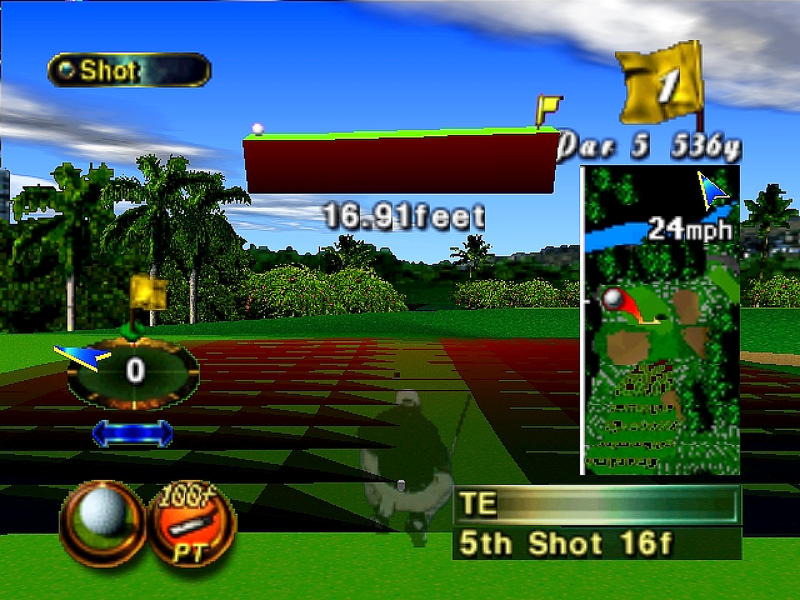 Other golf games have included this feature before, and it’s a great way of preventing things from getting too easy. 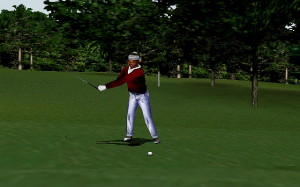 When you make your swing, you will see it cinematically animated. 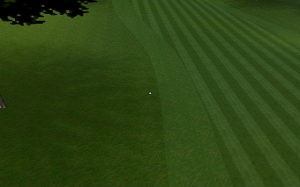 One more feature this game has that I didn’t care for is the “ball trail”, which you can see in one of the screenshots below. These trails can be shortened, but they can’t be turned off. 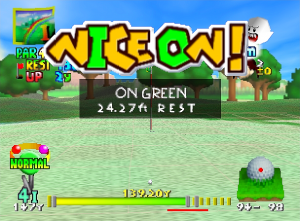 Getting onto the putting green changes the power meter to 2-button operation. 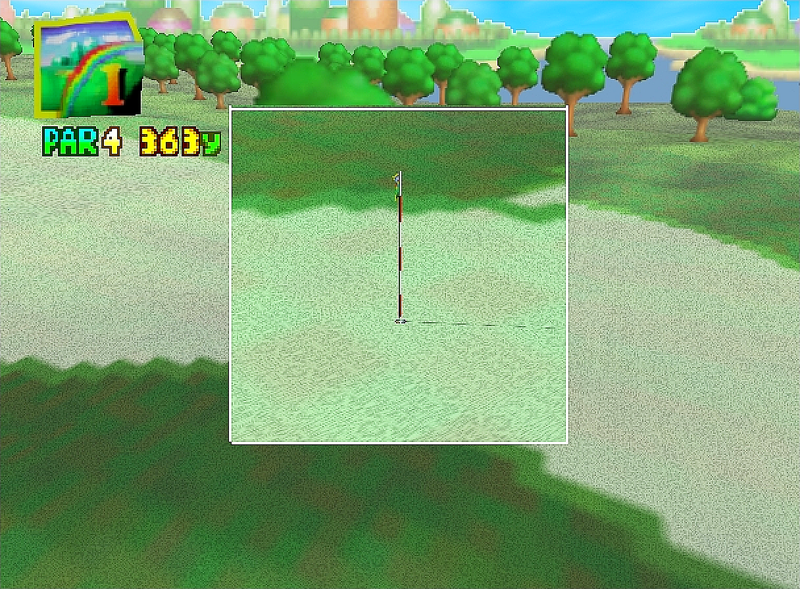 There are no terrain grids or other way of gaging the slope as far as I could tell. 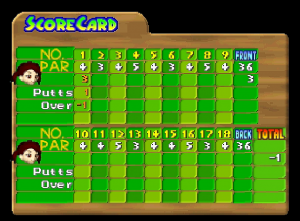 5 over par? I swear I didn’t do this bad when I wasn’t taking screenshots. 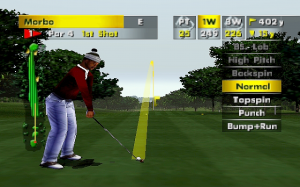 In fact I think there is either something wrong with this game or with the fact that I’m playing it on an emulator, because sometimes the golfer doesn’t appear to make the shots that I have set up. 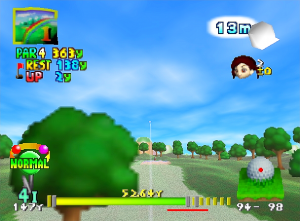 I’ll have to play it some more to see, but I think he pretty much ignores the power meter sometimes. 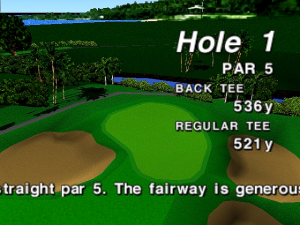 Other than that, this game scores rather high points with me. 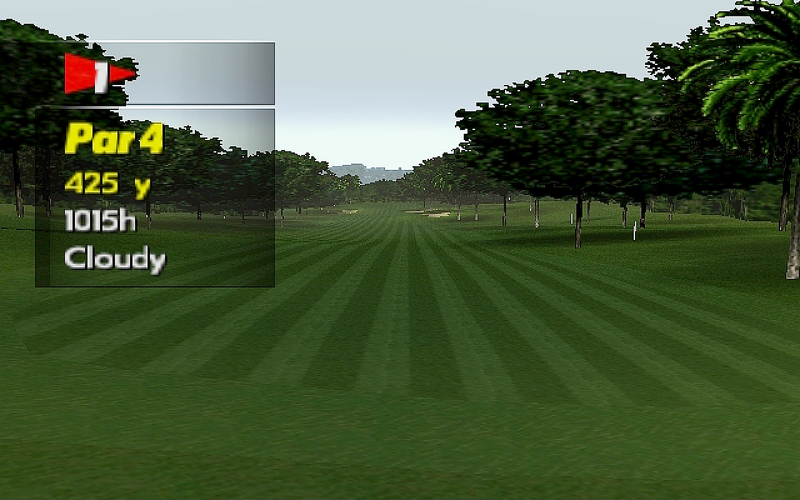 Little things make it enjoyable too, like when the game pauses and the golfer is seen swatting away mosquitoes. It’s definitely a surprise to see a golf game this good and this serious on a 3D system like the Nintendo 64. I had feared that every golf game I played on such consoles would be , well, bad. But it does have too many things I don’t like for me to play it regularly. 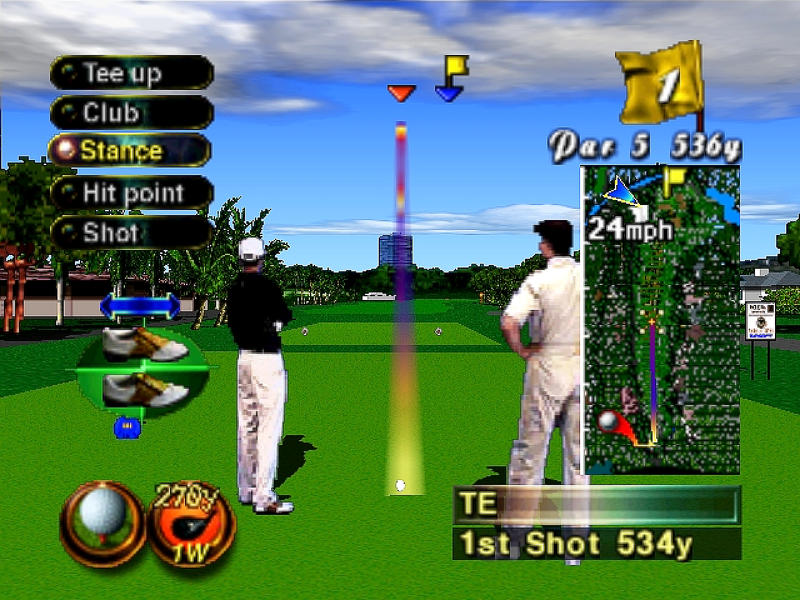 If I could turn off that aiming arc, I might even change my opinion of this game from good to great. But there it stands. If you have a Nintendo 64, check this game out. 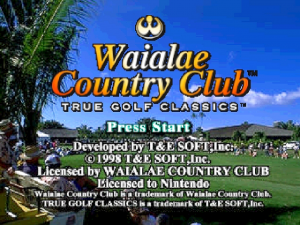 Or try it out on the Project 64 emulator on your computer. 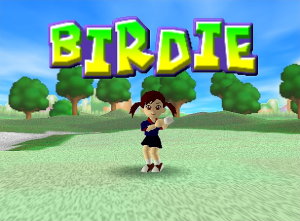 This game gave me an uneasy feeling when I saw that it was made by T&E Soft. This is the same company that made that horrendous mistake “Pebble Beach Golf Links” for the Sega Saturn. 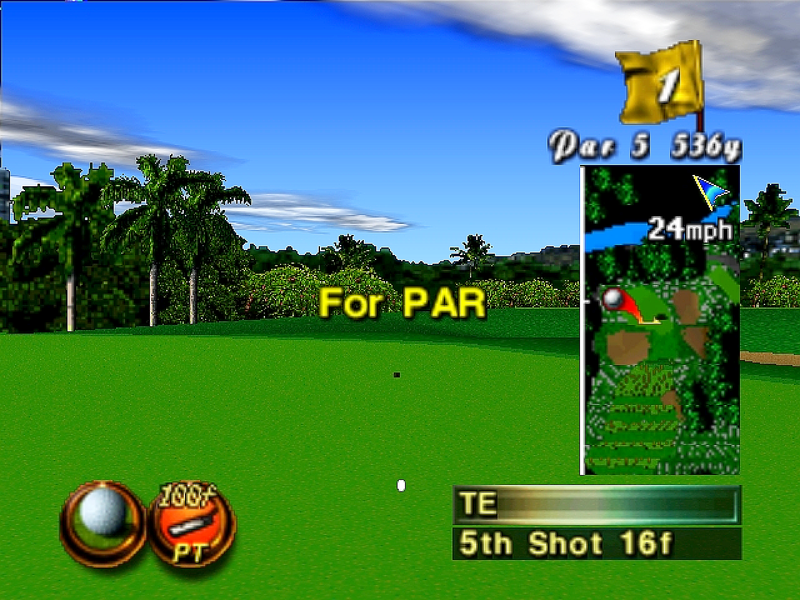 Then again, they also made “Wicked 18” for the Super Nintendo and “Pebble Beach Golf Links” for the Sega Genesis. 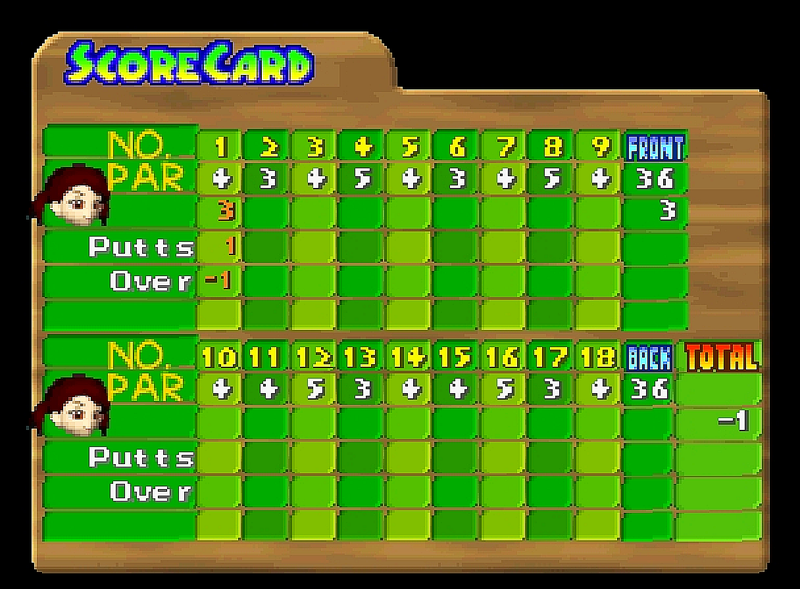 I liked those two games. Let’s see how T&E Soft did with this one. 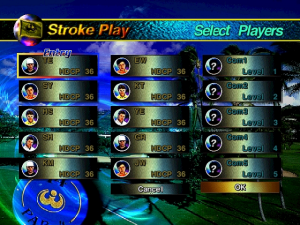 The first thing I went looking for in the options were the words “music” and “off”. 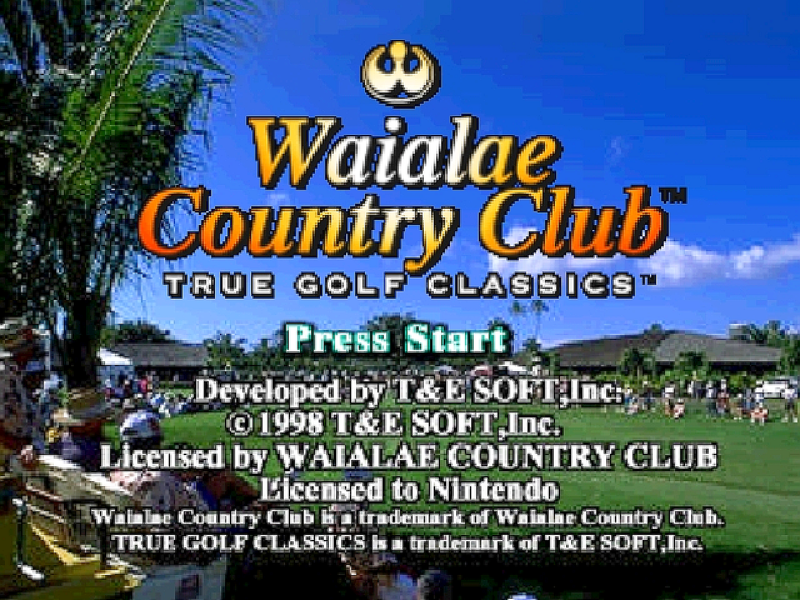 I am pleased to report that whatever in-game music this game has, it can be turned off. Huzzah! 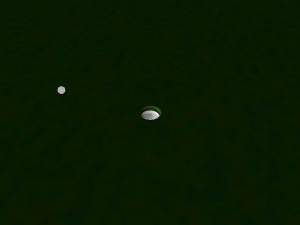 Also, the annoying ball trail visual effect can be turned off as well. 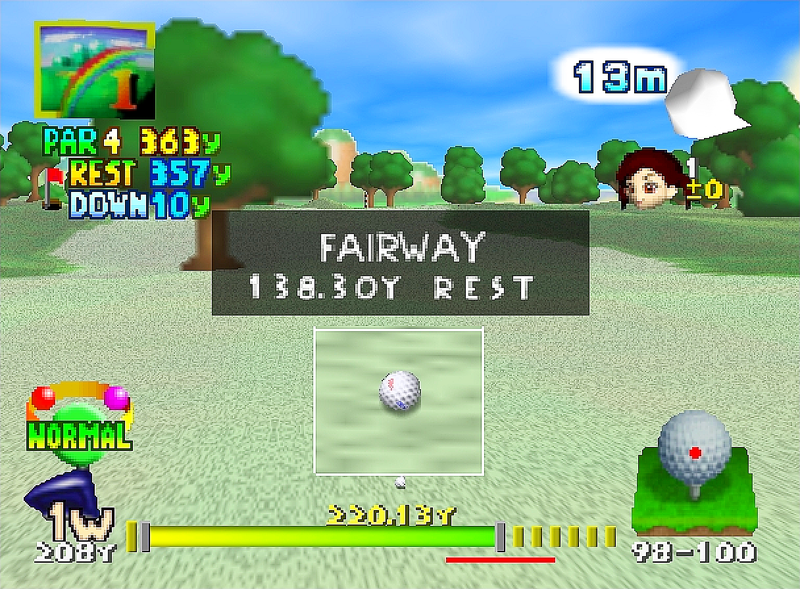 If you prefer both music and ball trails, then they can both be left on. Just don’t expect to ever get invited over to Robotman’s house for Video Game Golf Night. 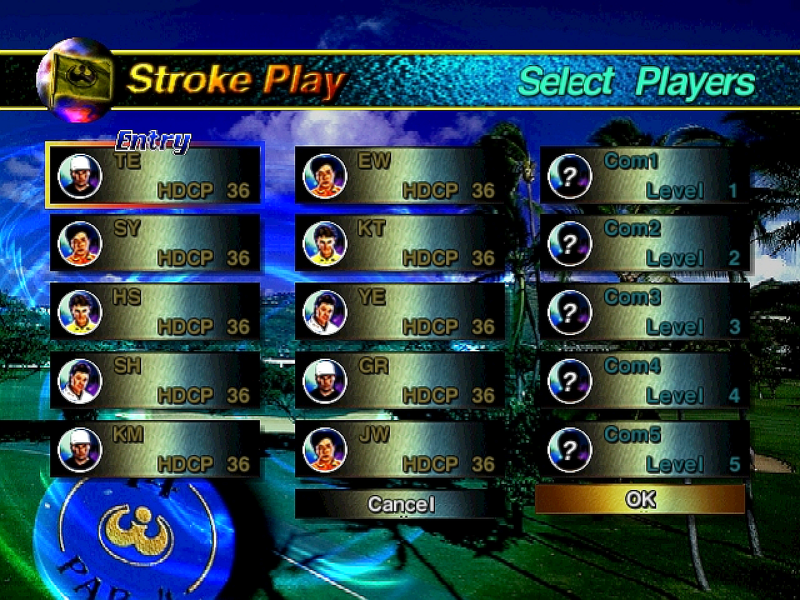 The interface and options screen are not as simple and well-laid-out as other golf games I’ve seen, but they get the job done. There is no way that I found that you can enter or change your name. 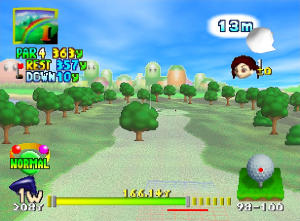 The reason for this is likely Nintendo’s refusal to let the N64 use optical discs as media for games. They got a lot of flak for this at the time, but they stuck to their guns. 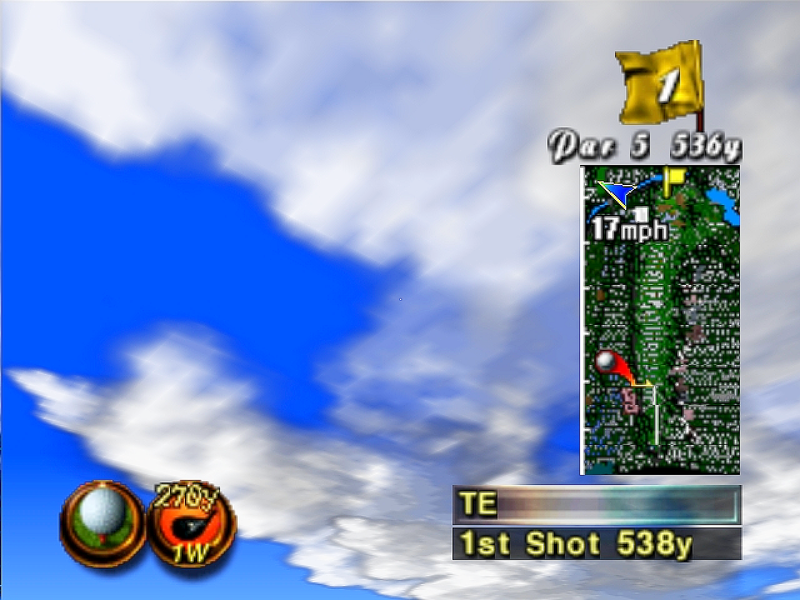 Instead of expanded storage for things like flyby narration, more music and video cut-scenes, N64 owners got lightening quick cartridge load times. 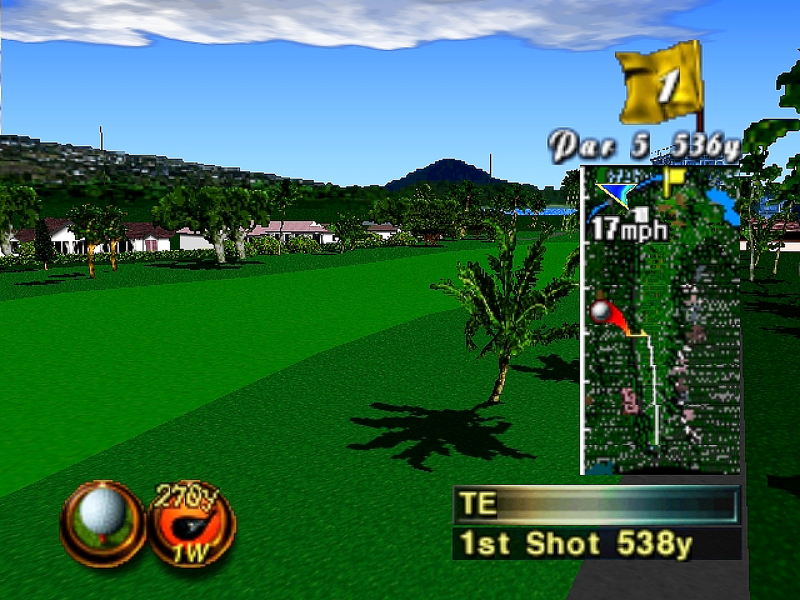 When you get to the course view, you see that you have that blasted aiming arc again. Only this time it isn’t a yellow piss rainbow, it’s a rainbow rainbow. 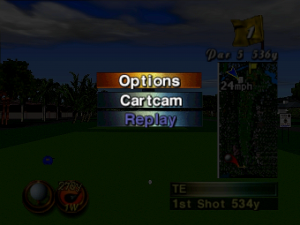 If you choose the “Cartcam” option, you can view the course using the direction pad or analog stick. The camera pad can also be used to control the camera in this mode. 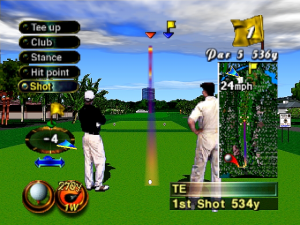 B exits to the course view. 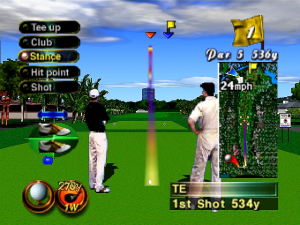 The “Tee up” option allows you to move the starting position of your tee. 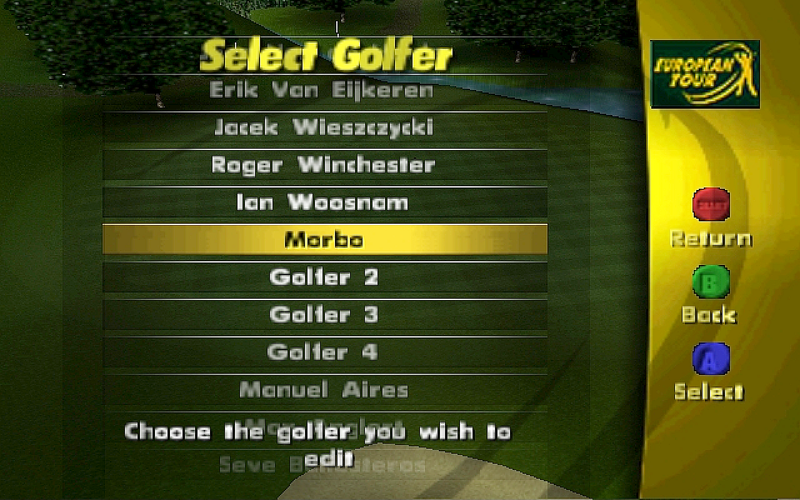 The “Club” option allows club selection. 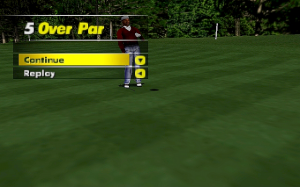 The “Stance” option allows you to change your stance. 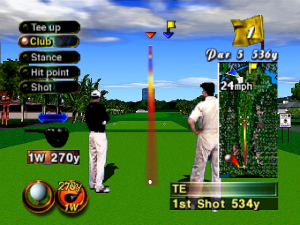 The “Hit point” option allows you to select the point on the ball where your club will strike. 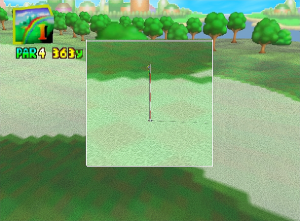 Pressing L on the camera pad will bring up a terrain grid and a slope graph. 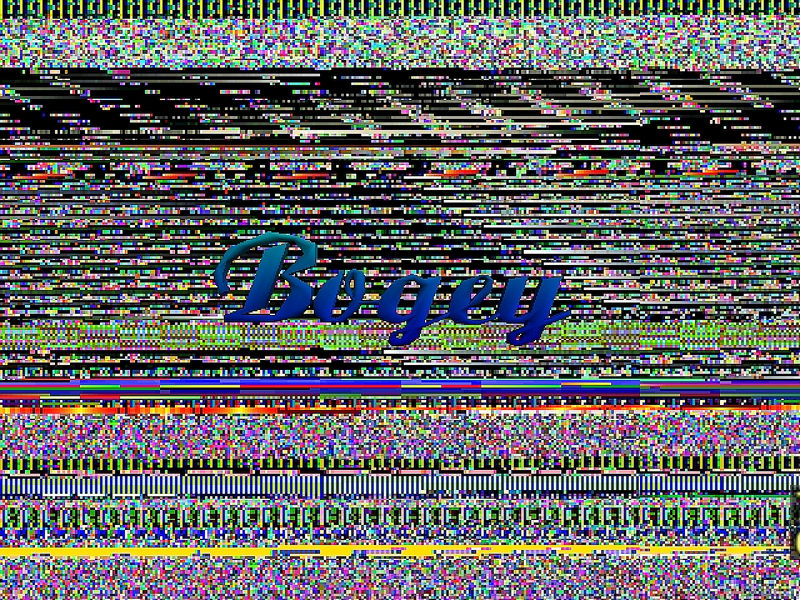 Here you can see that the Project 64 emulator doesn’t quite handle this correctly. 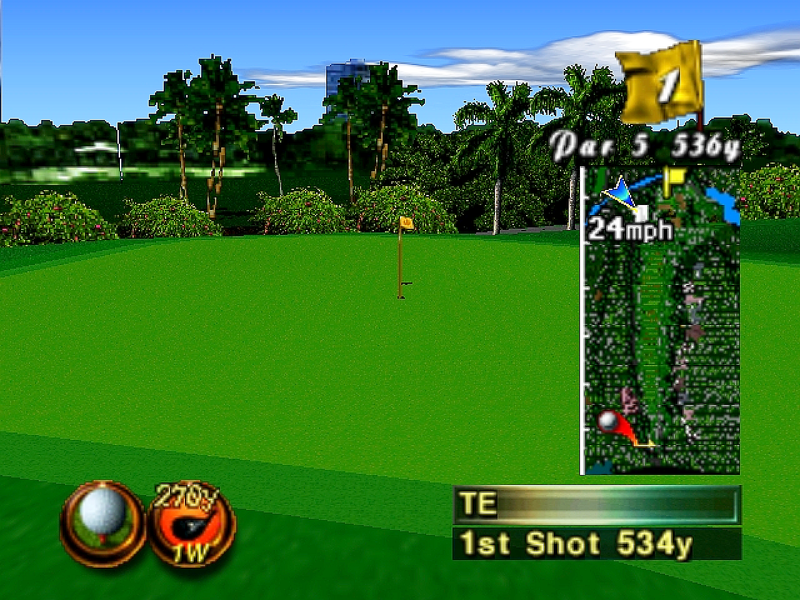 Left and right on the direction pad (or analog stick) will aim your shot. The left and right shoulder buttons will also move your aim, but they will do so in rather uselessly large jumps, so it’s best not to touch those buttons. When you’re ready to make your swing, press “Shot”. The power meter that encircles you is 3-button type. After you send the ball flying (hopefully) in the right direction, you will see it animated cinematically in the best graphics that the Nintendo 64 could handle. 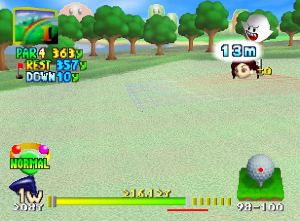 The putting green doesn’t change much, but your caddy does go away. You also get that grid and graph popping up for you automatically. 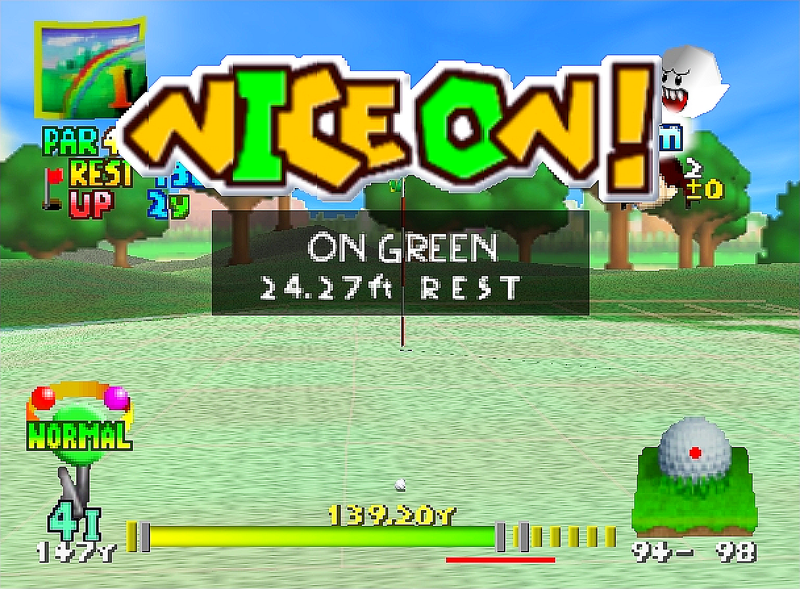 I’m sure this looks nice on real hardware. 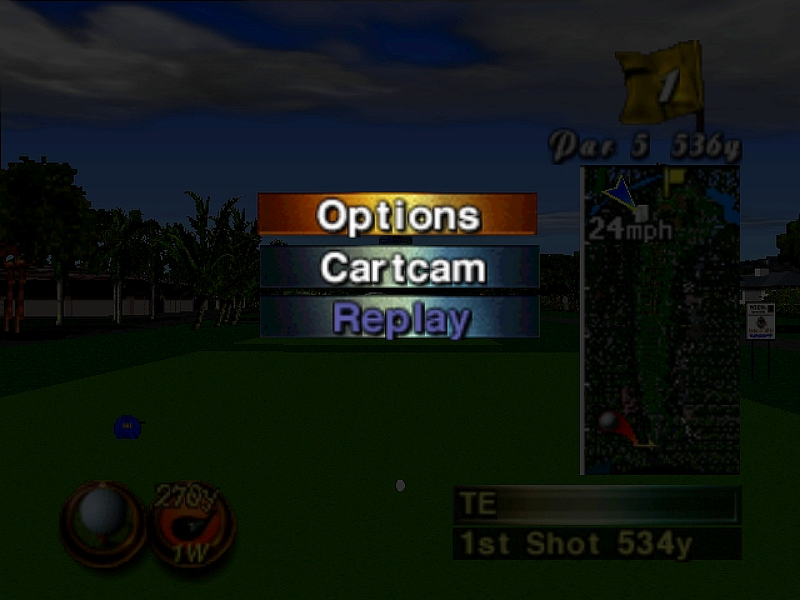 Getting near to the hole gets a zoomed shot of the action, but this also suffers from being played on an emulator. 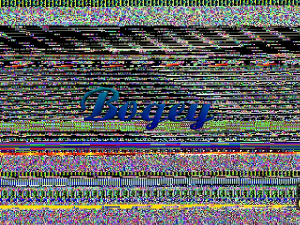 And I think there’s something wrong with the way this screen looks. So “Waialae Country Club” is without question a huge improvement over the mess that is “Pebble Beach Golf Links” for the Sega Saturn. 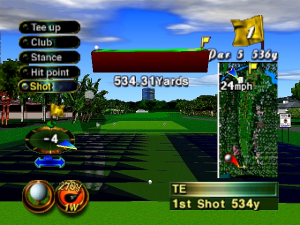 You’ll notice I didn’t complain once about the animation or the caddy. I’d say that this game is on the same level of enjoyment as “PGA European Tour” for the Nintendo 64. Good but not great. There are some things that I don’t like about it, and there are better games that I can play for other systems. 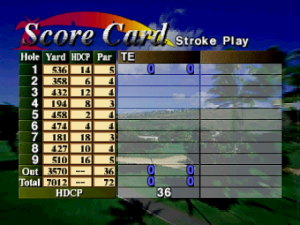 Overall, the N64 didn’t fare too badly for golf games. “Mario Golf” alone makes it a hit if you are only looking for fun and easy golf games for the kids, so it’s worth remembering for that reason. 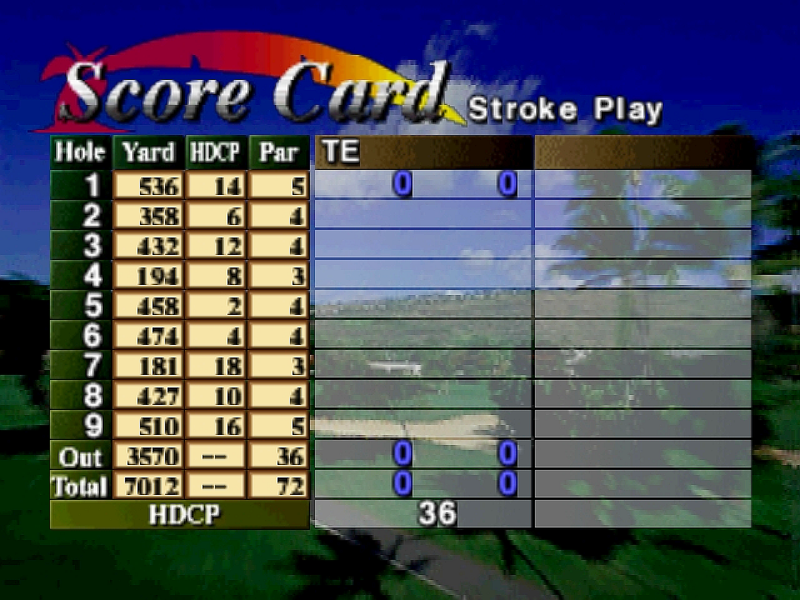 This entry was written by Robotman, posted on June 26, 2013 at 5:39 pm, filed under Reviews, Video Game Consoles, Video games and tagged Golf, Nintendo, Nintendo 64. Bookmark the permalink. Follow any comments here with the RSS feed for this post. Post a comment or leave a trackback: Trackback URL.